Kind’s – Auto Sales Ltd. is the sole distributor of global brands such as Mercedes-Benz, smart, Renault and Michelin in Malta. With all these brands to choose from, there needed to be a way for users to find what they were looking for, quickly and easily. We gave the website an advanced product finder, filtering hundreds of vehicles and tyres. 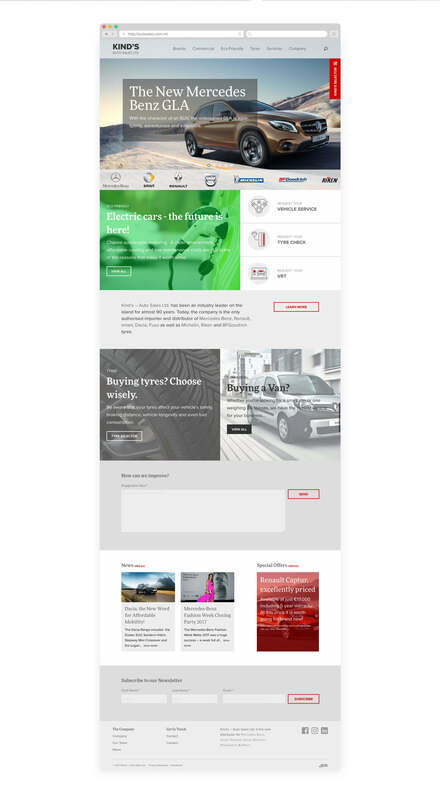 The website also required restructuring, a fresh look and feel, a repayment calculator and multiple contact points for clients to book VRTs, tyre fittings and vehicle services.